Crew members of the HMNZS Taupo. The joint Wasawasa operation between the Fiji Navy and the New Zealand Navy has commenced. The word Wasawasa is ocean in the iTaukei language. Operation Wasawasa is an effort to patrol Fiji’s Exclusive Economic Zone (EEZ) for illegal fishing and illicit drugs. 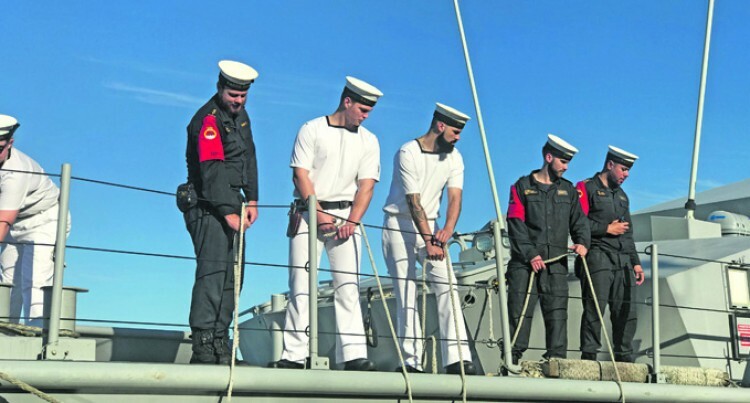 The HMNZS Taupo, with a complement of 24 personnel, ar­rived into the Suva waters last Friday for the three-month pa­trol under an agreement between the Fijian Government and New Zealand government. This is the second consecutive year that the New Zealand Defence Force is providing a maritime patrol vessel to support the operation. The first naval vessel HMNZS Hawea vessel returned to New Zealand December, last year after a seven month deployment in Fiji. “The deployment of the New Zealand Navy vessel HMNZS Taupo for operation Wasawasa is an example of how the Fiji Navy and Fiji collaborates with regional countries to tackle the problem of illegal, unreported and unregulated fishing,” Fiji Navy Lieutenant Commander Timoci Natuva said. “During the coming three months, the Fiji Revenue and Customs, Fiji Police, Ministry of Fisheries and Army will also be part of operation Wasawasa. “The combined maritime surveillance operations with Fiji would contribute to the multinational effort to ensure sus­tainable management of fishery resources in the South West Pacific. He said they hoped to learn from each other and further strengthen the ties between the two militaries. “We also expect the patrols to deepen collaboration between New Zealand and Fiji government agencies and strengthen defence cooperation between the two countries,” he said. “The primary vision of the deployment is to ensure the secu­rity and prosperity of Fijians by undertaking maritime secu­rity patrols, surveillance, boarding operations and operations to search and rescue call-outs. “We will be ensuring there is no illegal fishing as we have two fishery officers from New Zealand who is part of the trip and also two from the Fijian Ministry of Fisheries will be with us during the three months deployment. “Personnel from Fiji Revenue and Customs Authority, Fiji Navy will plan and lead the patrol. “We will also be checking super-yachts and other vessels to ensure that no illicit drugs are brought into the country. As this one way that illicit drugs are brought into Fiji,” he said. Meanwhile a World Bank report states that the Western and Central Pacific Ocean, regions that include the Pacific Island countries, supply about 60 per cent of the world’s tuna. Commander Joint Forces Major General Tim Gall said the combined maritime surveillance patrols with Fiji would also contribute to region-wide efforts to promote sustainable fish­ing. “Together with Fiji authorities, we want to reinforce the mes­sage that we are committed to protecting valuable Pacific fish­ery resources,” Major General Gall said. “New Zealand and Fiji, as well as other countries in the re­gion, have a shared interest in ensuring these resources are managed effectively,. The combined maritime patrols with Fiji last year achieved strong results, with about 550 vessels boarded and 110 alleged infringements detected. About 50 Fiji Navy sailors, 27 customs officers and 19 fishery officers also trained on Hawea.